Metatarsal fractures are usually due to direct trauma. Often they are part of the Lisfranc fracture-dislocation spectrum. A AP and oblique radiographs of the foot. 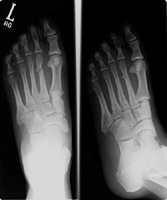 These show a minimally comminuted fracture of the distal aspect of the second metatarsal. 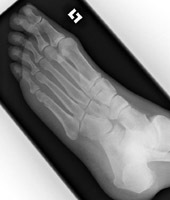 B Oblique radiograph of the foot shows a fracture of the distal apsect of the fifth metatarsal.